UK footwear chain Barratts has collapsed into administration for the second time in less than two years, putting more than 1,000 jobs at risk. Reports surfaced last month that the Bradford-based firm was in trouble, and it has now been confirmed that administrators from Duff & Phelps have taken control of the retailer. Barratts Shoes employs 1,035 people in the UK and Ireland, including 521 full-time staff, and operates from 75 stores and 23 concessions. The administrators say they are reviewing the company's financial position whilst seeking a going concern sale of the business. "At this stage redundancies and/or store closures cannot be ruled out," a statement said. "Difficult trading conditions in the sector led the directors to explore potential refinancing options and additional equity for the business," explained Philip Duffy, Duff & Phelps partner. "The company had recently received an offer from an investor to inject GBP5m (US$8m) into the company, but that offer was withdrawn on the evening of 7 November. "In view of the financial position of the company and withdrawal of that equity offer the directors were left with no choice but to appoint administrators." Newspsper reports last month suggested the retailer was seeking a GBP3m (US$4.8m) loan to help pay for stock in the lead-up to the Christmas shopping period. It was claimed that company owner Michael Ziff has approached asset-based lenders and turnaround investors for the money. This is the third time Barratts has slipped into administration. 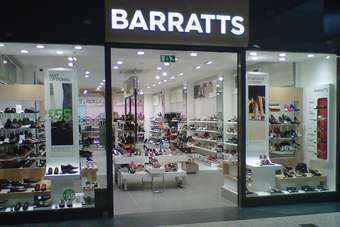 In December 2011, the Barratts Priceless Group - owner of the Barratts and Priceless Shoes footwear shops - collapsed into administration after a downturn in trading. Prior to this, previous owner Stylo called in administrators in January 2009, with Ziff rescuing 160 stores as well as 165 concession outlets.